Conceived in 2004 by French activist Louis-Georges Tin to commemorate the decision of the World Health Organization (1990) to de-pathologize homosexuality by removing it from the International Classification of Diseases, May 17th has become a globally recognized day to raise awareness of LGBTQI lives and call attention to efforts to end discrimination and violence and promote equality. This year, from China to the Congo and Canada, LGBTQI peoples and our allies in over 170 nations will sponsor conversations, festivities and events, as well as demonstrations and marches for an end to the criminalization of Queer life and the implementation of policies that recognize and respect the diversity of God’s creation. In Botswana, activists will showcase the first short theater production focusing on original works with Queer themes. In Iran, the Iranian Queer Organization will make sure that IDAHOBiT artwork is available in Farsi. The United Nations Human Rights Office in New York City will highlight Queer lives worldwide on screens in Times Square. Everyone can do something to highlight LGBTQI life and our victories or address the challenges that remain before us. 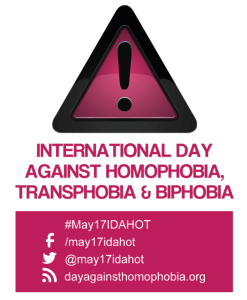 The Global Justice Institute and the Moderator’s Public Policy Team invites MCC congregations around the world to make May 17th INTERNATIONAL DAY AGAINST HOMOPHOBIA, BIPHOBIA AND TRANSPHOBIA SUNDAY! Host a gathering and invite your neighbors, family and friends to the movement for equality in your location and make them aware of what volunteer or organizational opportunities are available. Invite a local activist group to speak or provide resources. Host a Bible Study, preach and pray about ending discrimination and promoting peace and goodwill throughout the earth. This year’s theme focuses on youth. Volunteer at a local youth shelter or conduct a drive to support the work of a local youth initiative that includes LGBTQI kids. Every word offered, every event celebrated, every step taken, every prayer lifted up can and will make a difference for God’s LGBTQI peoples and a world at peace with its own diversity. You can inspire others around the world by sharing what you do. Send your stories and photos to The Rev. Dr. Jim Merritt of the Public Policy Team at [email protected]com. Metropolitan Community Churches and the Global Justice Institute, Rev. Elder Pat Bumgardner-Chair.